Everyone has their reasons to get to Mars. For MOM, it was the sheer audacity of carrying a billion dreams to a destination far beyond the celestial realms of human imagination. For Alia Bhatt, it could be the attendant bliss of landing on a planet full of chocolate bars. For someone like me, ita��s the joy of seeing a topography teeming with interesting names. Talking of topography, the red planet is one massive scar-face with a staggering 6,35,000 impact craters created by crashing meteorites, asteroids and comets. The Interna-tional Astronomical Union (IAU) has taken the pains to label around 1,000 of them. A quick glance at their nomenclature will make your day. At least eight craters have been named after Indian cities. They include Amet, Bhor, Broach, Kakori, Poona, Rayadurg, Sandila and Wer. If youa��re scratching your head as to why they chose low profile cities, well herea��s the logic: all the small craters on Mars are a nod to places on earth with a population of 1,00,000 or less. Poona, with five million residents, lucked out though. 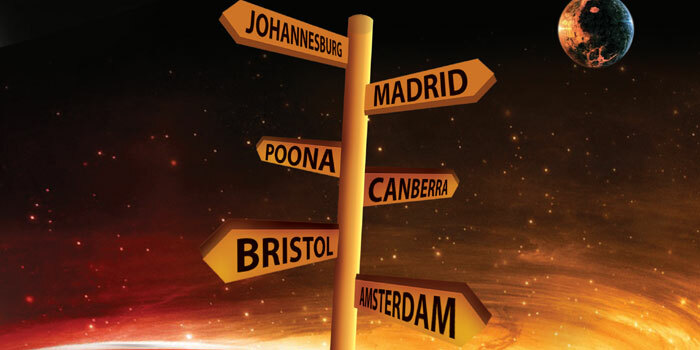 Just like Madrid, Johannesburg, Canberra, Bristol and Amsterdam. But for one, I am not complaining. The bigger cratersa�� list reads like an all-star line-up of scientists and explorers. Apart from the usual suspects such as Leonardo Da Vinci, Galileo Galilei, Tycho Brahe, Isaac Newton, Ptolemy, Kepler, Columbus and Balboa, the beauty of the entire thing is that one can find an assortment of littler giants who pique your curiosity. There is Wilhelm Beer, the man credited with creating the first globe of Mars; Hipparchus, the founder of trigonometry; Nathaniel Green, an astronomer whose pencil drawings of Mars were world famous; and Carl Sagan, the brain behind the Mariner9 and Viking missions. The only Hollywood star to be immortalised is Orson Welles, the man who caused a scare by broadcasting the Mars Attack saga, The War of the Worlds. Star Trek fans will be pleased to know that Gene Roddenberry, the creator of the TV series we all adore, has a crater in his name along with fellow writers Isaac Asimov, HG Wells and Edgar Rice Burroughs (aka the Tarzan guy). Although Arthur C Clarke is a strange omission, considering his first novel was titled Sands of Mars. Who knows, they might name a desert after him, someday. Know any interesting Martian name origins? A�Mail them to anantha@albertdali.com.